This paper presents the results of estimation of the model of interaction between social transfers and remittances. Compared to previous studies, this paper estimates non-monotonic “crowding out” effect by an innovative empirical model specification. The model is then estimated by the two-stage Heckman’s selection method, where the receipt of remittances is the first stage, and amount of remittances received second stage dependent variable. 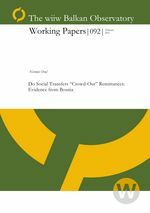 The findings suggest that social transfers crowd-in remittances and that the predominant motive for sending remittances to Bosnia is exchange. In addition, the results do not support the Cox (1997) hypothesis about non-monotonic transfer motives.